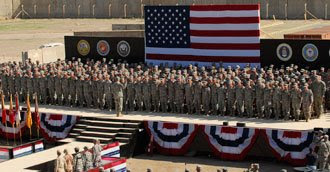 JOINT BASE BALAD — Nearly 300 servicemembers stationed across Iraq gathered at Holt Stadium here Tuesday to re-enlist in what officials said is the largest mass re-enlistment in the base’s history. After helicopter and convoy movements and rehearsals, 274 servicemembers swore oaths to defend their country again. To the re-enlisting servicemembers, the significance of holding the ceremony on Veterans Day was important. Army Col. Kevin O’Connell, commander of 1st Sustainment Brigade, said Soldiers stay in the Army for the same reasons they join: training, education, adventure, money. But the most important reason they stay in the military is service to their nation, he added. While she was not planning to make the Army her career, said Army Sgt. Latasha Myers, a mechanic with the 503rd Maintenance Company, her experiences and the people she works with inspired her to re-enlist. O’Connell said friends and families should be proud of what their sons and daughters did this day. Lally said the re-enlisting servicemembers are common men and women who always have done, and will continue to do, uncommon things.